When David told me he was giving me a Lemon to play with I was a bit miffed. What the heck am I going to do with a sour citrus fruit? "Funny David" I though. 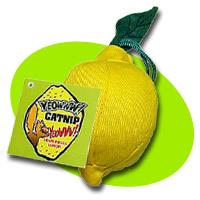 Then he put the lemon on the floor and I found that it was not a sour citrus fruit, but a wonderful catnip stuffed, life sized lemon! The area filled with the wonderful odor of top grade catnip and I felt like a kitten again!